Will you be willing to pay 59p a week for the privilege? The latest social news app for Apple iPad, News.me has finally arrived on the App Store this week, offering users one week free, after which they will then need to sign up to a 59p-a-week subscription. 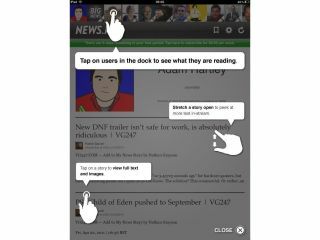 The iPad app will also provide you with a list of news content that your friends on Twitter are currently viewing, very much like other apps such as Flipboard and Zite, with the developer promising a "seamless interface for immersive reading" which somehow "uses science" to provide you with the most relevant personalised content. If you have an iPad then you can test out the News.me social news aggregator for free right now, just head over to the iTunes App Store. If you like what you see, then you can pay 59p per week to keep using the app. Indeed, if you really like what you see, then you might even want to pay the annual subscription of £20.99 up front.